Today, the Round the World Race has accustomed us to the harsh realities of the great oceans south of the Cape of Good Hope and Cape Horn, where mighty westerlies blow unimpeded right round the world. We now know that, if anything, the waves are bigger and the winds are stronger than had been formerly thought. But in coping with these extreme conditions, the professional crews of the modern 60ft craft racing round the globe are in constant touch with the outside world by radio and satellite communications. They have radar to warn of hazards ahead. The conditions may be on the edge of survival, but contemporary technology and instantly activated rescue equipment and emergency beacons make the hazards manageable, the apprehension controllable. When Conor O’Brien made his pioneering circumnavigation in his little vessel in 1923-25, the rugged latitudes of Roaring Forties and the Screaming Fifties were little known. They were the region of only the toughest professional sailors, challenging the might of the Southern Ocean in relatively large ships. They sailed across an empty storm-tossed waste known only to the wandering albatross. Thus it was an act of heroism for an amateur skipper and his crew to take on such waters in a little ship in the days before radio communication, spending days, weeks and months sailing in complete isolation in a totally sail-driven vessel only 42ft long. 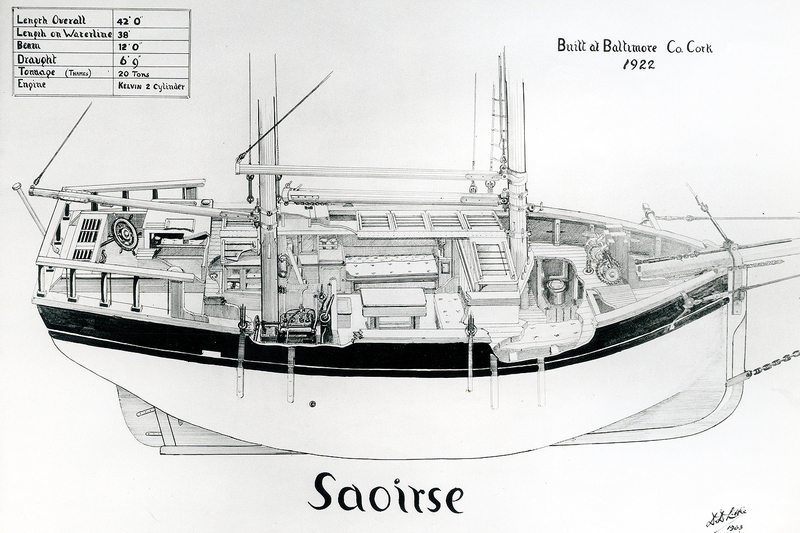 For the dream-ship which Conor O’ Brien created with master shipwright Tom Moynihan and his men of Baltimore in West Cork in 1922 was just 42ft in overall hull length. While her accommodation below was modern in its layout, reflecting her owner’s architectural skills, her outward appearance was if anything old fashioned, as O’Brien wished to deploy trusted technology for his great voyage.